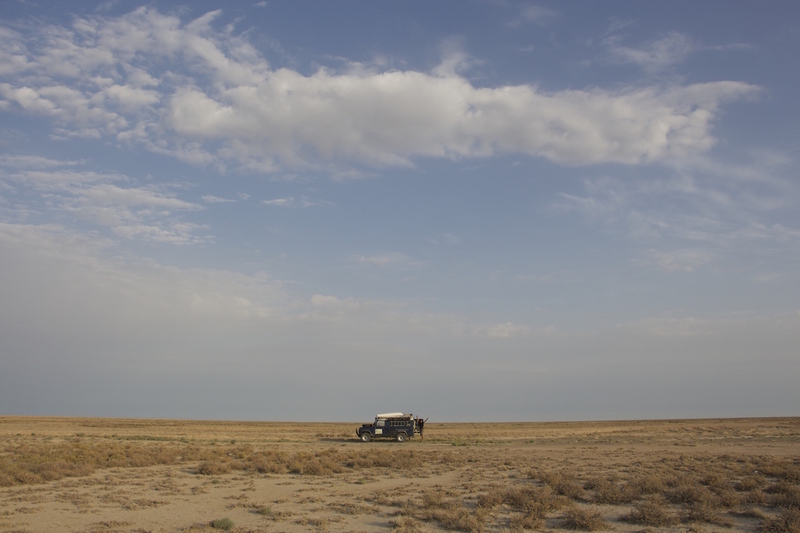 Our first stop in Uzbekistan was one of the most isolated, desolate and beautiful places in the country, the Ustyurt Plateau in the north west of the country, bordering the dying Aral Sea. Despite first impressions of this vast, open and seemingly empty plain, the Ustyurt Plateau is in fact brimming with life, including the Ustyurt fox, numerous birds of prey and small mammals, and the endangered Caracal and Saiga antelope. 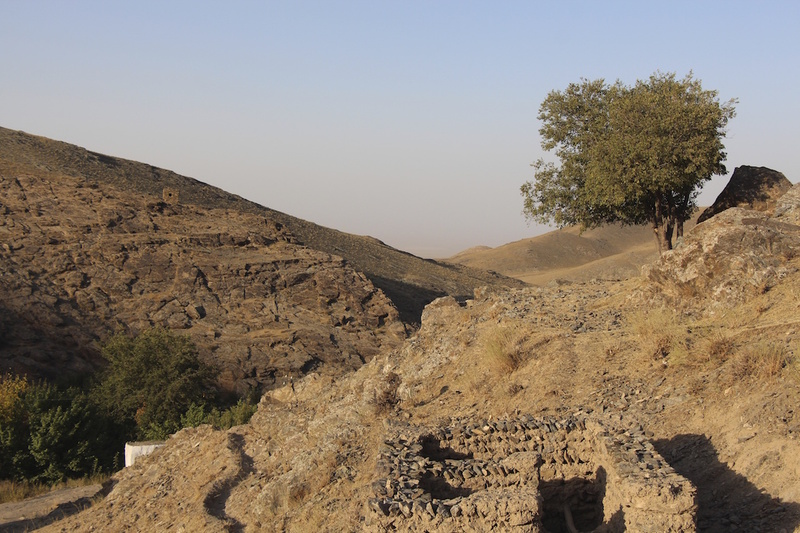 It is also home to beautiful geological features, the ruins of ancient Silk Road fortresses, and the Karakalpak people, with their own unique culture and language. Sadly, we did not have the luxury of being able to explore the plateau as we would have liked, as the delay crossing the Caspian Sea meant we needed to make swift tracks to the capital Tashkent to honour a scheduled meeting with Lena Bykova from the Saiga Conservation Alliance. The SCA are working to preserve some of last remaining populations of the acutely endangered Saiga Antelope that pass through this area on their annual migration. 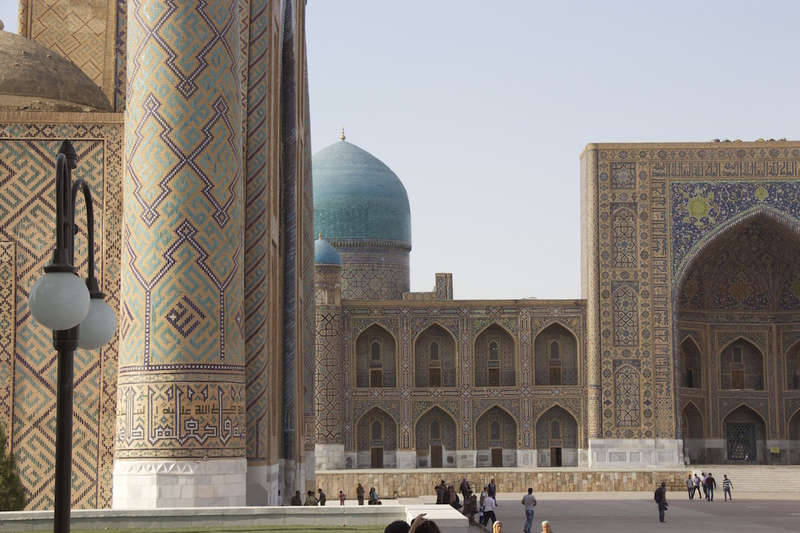 Our route across Uzbekistan to Tashkent took us through three of Uzbekistan’s most famous cities: Khiva, Bukhara and Samarkand. I shall not delve too deeply into their fascinating histories here, but suffice to say that each has played a pivotal role in the empires that have moved through these lands, from the Sogdian in the 4th Century BC through to the Russian and British Empires in the 19th Century. The cities were ancient centres of learning in the arts and sciences, from algebra to medicine, astronomy and poetry that at the time were unrivalled in the West. 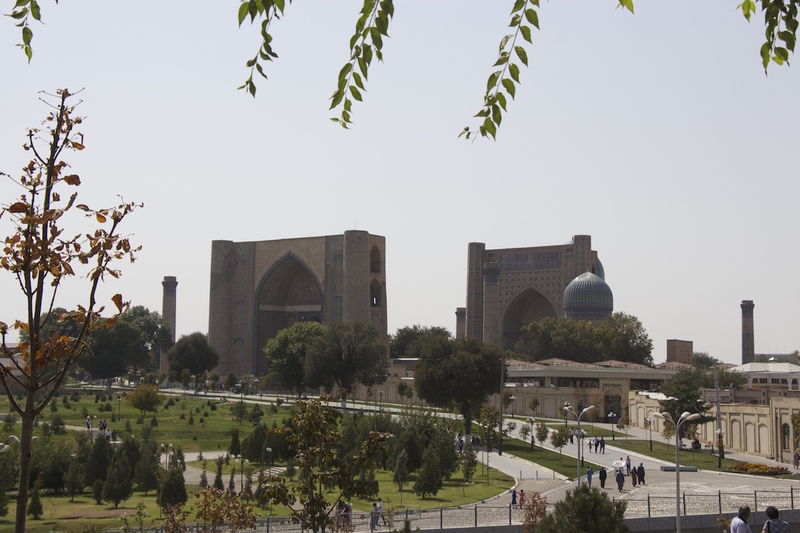 They were the birthplace of great thinkers, such as the astronomer, mathematician and sultan, Ulugh Beg (1394-1449), and his grandfather, the renowned military leader Timur, who killed an estimated 17 million people (5% of the world’s population at the time) during his military campaigns. Having conquered much of the Middle East, Central Asia, and northwest India, including Delhi, Timur was only stopped when his army was caught in an unusually brutal winter while marching on the Chinese Empire. Carefully restored in recent years, the cities’ architecture reflects this history, and it was fascinating to have the chance to learn and observe the rich heritage of the country. The architectural beauty of these desert cities really cannot be overstated. Although ravaged by the invading Mongol armies, the cities were lavishly developed under the rule of Timur and his successors. Their visual impact is breathtaking, with the immense and vibrant turquoise domes of the mausoleums, mosques and minarets and intricately decorated façades dramatically offset by the desert-brown settlements and arid land surrounding them. Although the impact of the Soviet era in the region is a matter of fierce debate, one of the superb investments that was made was in restoring the beautiful architecture in many of the historic cities in the country. 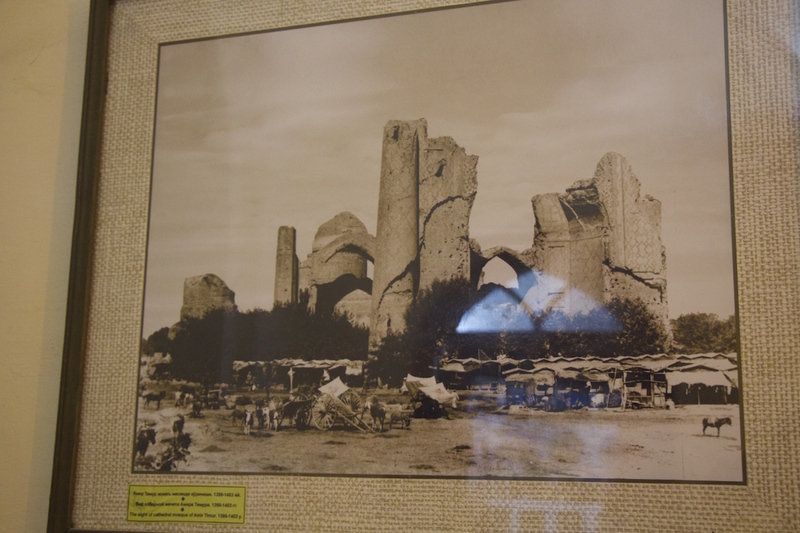 Below you can see the terrible disrepair that the Bobi-Khanym mosque in Samarkand had fallen into prior to Soviet restoration and how it looks today. Much of the city has been beautifully restored in this fashion, and these iconic structures are once again proudly inviting visitors to marvel at the accomplishments of previous empires. The natural environment is equally beautiful. Thanks to some wonderful people we met on the trip, such as Lena Bykova and her family from the SCA and Alexey Volkov from the UNDP, we had the fortune to be pointed in the direction of some real gems. One area that deserves special attention is the Nuratau Mountains. Rising out of the Aralkum desert on the edge of Lake Aydar, these mountains are barren, bare monoliths of rock. Life cannot be easy in this dry, stony environment, and the communities run like rivers of green along the valleys where scant water flows. 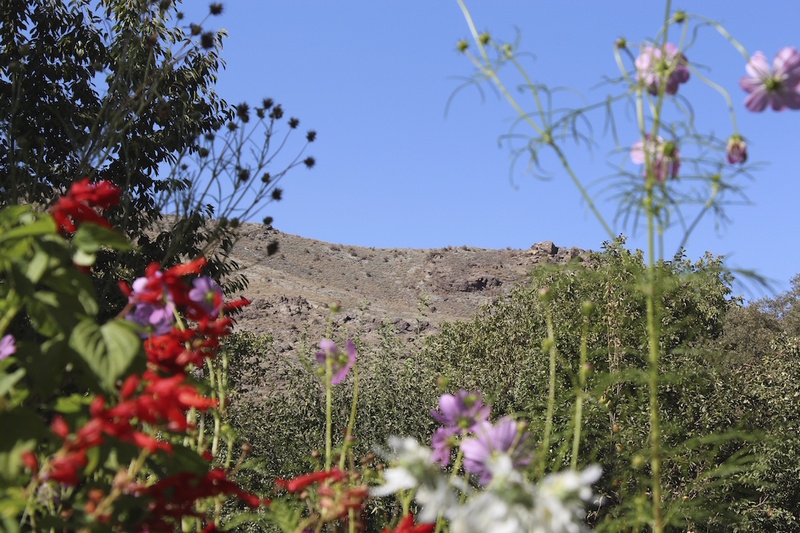 The area is home to a minority Tajik population and an established ecotourism project that allows visitors to stay with local families. This is a real treat. We stayed at two guesthouses, with Rahmed at Yashigul in Asraf village and Shiringul in Hyatt village. Stepping out of the desert and into the shade of the walnut and fruit trees was like stepping into a little bit of Eden. Surrounded by the vibrant colours of the gardens and mountains, our hosts served tea and sweet treats on raised tea platforms in the gardens. The dinners were superb (accompanied by local wine), and for a brief moment we forgot the long drive through the desert and the trail ahead and lost ourselves in the peace and tranquility. 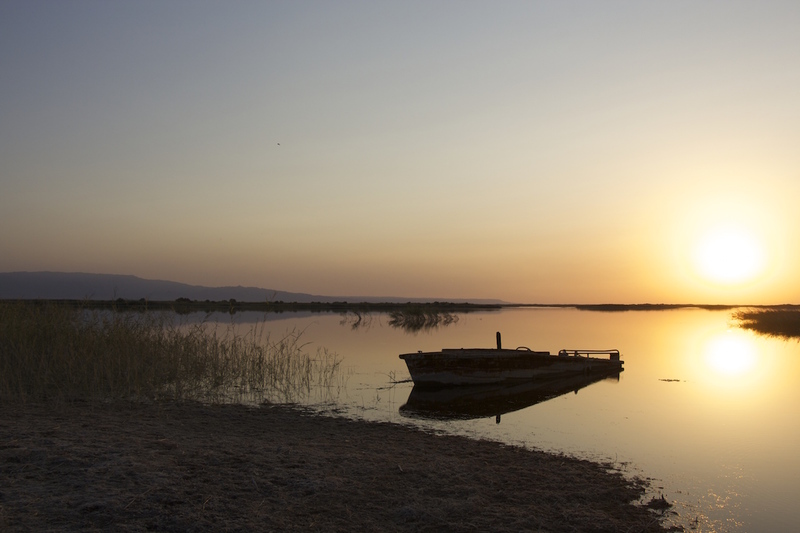 As always, however, time was pushing us on, but before we headed back to the bustle of Tashkent to prepare for the next leg and the crossing to Tajikistan, we took a detour to Lake Aydar. We declined the opportunity to stay in a yurt by the lake, and opted to put Boggles’ off-road abilities to the test and cut our own path along the lakeshore. The lake took us both by surprise. We fully expected the desert to roll into the water. What we found was a wetland wilderness, full of plant and bird life and, rather than being one large lake, the shores of the lake consisted of numerous pools that presented a kind of maze that needed negotiating in order to move closer to the main body of water. Despite our best efforts, this maze defeated us, but after passing numerous rustic fisher-camps, we eventually found a secluded spot to set up camp (something that we had been unable to do frequently, as tourists are required to register and stay in official hotels each night they are in the country). 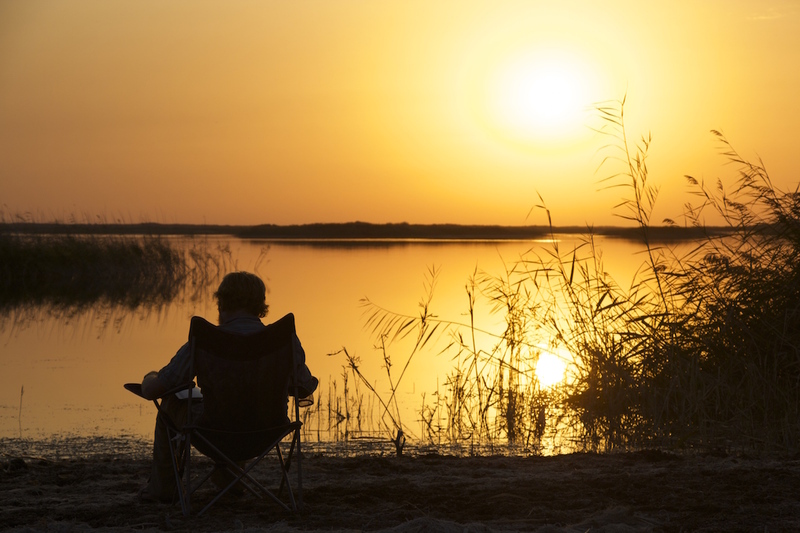 Even in this remote landscape, we did not avoid the attention of the local fisher-folk, who stopped by our camp as the sun began to set, curious to observe what must surely have been the unusual sight of two westerners setting up camp on the lakeshore. We were offered fresh fish the following morning as the first boats came in, sadly too late to pop it on the previous night’s BBQ. We packed up camp, gave our thanks, and began the long road back across the desert, driving past the numerous cotton fields that lined the road. Leaving behind the Golden Road to Samarkand, we began the onward journey to the majestic, high altitude Kingdoms of Tajikistan and the High Pamirs.